Blogging is a really great record of time. I have really missed it over the last 6 months or so but really have not had the energy or the mental space to give any more. I've posted 63 times this year, compared with nearly 400 the year before. This avid daily blogger got blogger burnout! Juggling the pressures of work, the death throes of a PhD and a very dead beat Prof, two Directorships to manage and new businesses to grow and a family to try and spend some time with and negotiate all that two teenagers and a two year old can throw my way...well, I've been reading blogs but not commenting or able to take any mind space and write on my own. Toss in a big home and garden and travel for work and my time has felt rather thin. I cant even take photos anymore! Thats what I realised tonight when I browsed through my blog and my Flickr account- that I'm so glad I took the time when I had it to journal in both words and pics, the daily passing of our lives. Its been lovely looking and reading over the minutiae of life over the last few years. How very glad I am that I started blogging. Maybe Im feeling the return of some emotional space and strength to start again, life has just been so so full. I'm ready to stop and smell some roses. I want creative time back in my life, hence an attempt to start with some freshness of Spring with a with a new look blog. Anyone remember these? 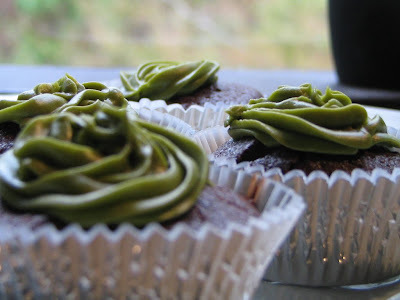 Peanut choc and almond cupcakes with green tea icing. I found them in my archives. They were good. very very good. I've decided to remake them tomorrow (sans silver pans). The kids will love me for it. Here's the recipe if you're up for it. It is then not too bad that I have not had the time to comment too often in the last months either! How did it happen? Time flies! aah, you made my much smaller crazier world seem small when I read you large and crazy version! no wonder you have no time to blog! it is lovely to look back over the bits and pieces. a great record. spring is a good time to reinvest and reinvigorate - enjoy!